At tonight's JPCA meeting, Deputy Inspector John Mastronardi announced he would be transferring to another post and introduced his replacement, Captain Victoria Perry. Capt. Perry lives in Queens and is the first female commanding officer of the 104th Precinct in more than 20 years. The Newtown Historical Society will be conducting a tour of the historic areas of the western end of Forest Park on Saturday, April 27th from 10am-noon. The tour will conclude with a self-guided walk inside the Queens Greenhouse. 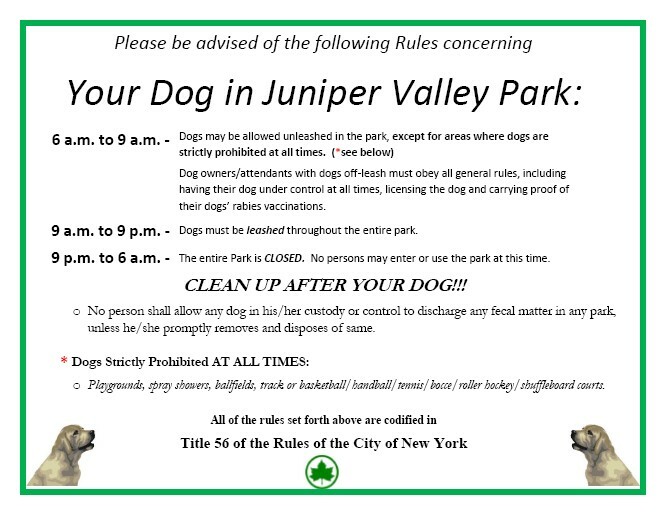 It's been a while but our next Juniper Juniors Cleanup is Saturday, May 18th 10am. Eliot Ave and Lutheran Ave. We will be painting! Democratic Candidate for Queens District Attorney Greg Lasak and the Neighborhood Coordination Officers from the 104th and 108th Precincts will be on hand to speak and answer questions at the April 25th JPCA Town Meeting at Our Lady of Hope at 7:30pm. The 104 Precinct found this dog by 69th place and central avenue. Please come down to the 104 Precinct located at 64-02 Catalpa Avenue or call 718-386-3004 if you have any information. Meeting is Wednesday, February 27th at 6:30 at Christ the King High School. Covers Middle Village and southern Maspeth. The Ridgewood Reservoir in Highland Park has officially been designated a wetland by the NYS DEC after 11 years of advocacy by a coalition of environmental and historic preservation activists. In observance of Presidents' Day, the New York City Department of Sanitation announced that there will not be garbage, organics or recycling collection, nor street cleaning, on Monday, February 18, 2019. The Juniper Park Civic Association (JPCA) honored Queens Parks Commissioner Dorothy Lewandowski with the organization's 2018 Community Service Award. Do you agree that congestion pricing is what is needed to fix the MTA?